Cemetery Lane, Bradford on Avon; from its junction with B3107 Holt Road to its junction with Kingsfield Grange Road. To enable: UK Power Solutions to carry out installation of 750m HV/LV cables and 125m of gas pipes. 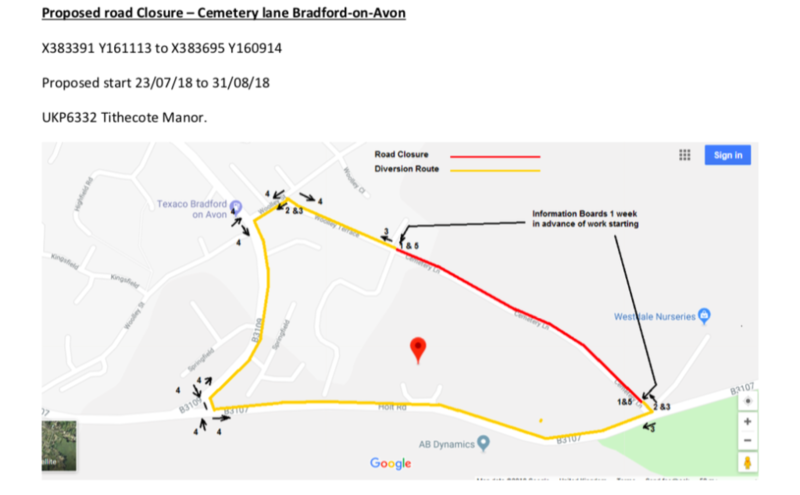 Alternative route: via Woolley Terrace – Woolley Street – B3109 – B3107 Holt Road and vice versa. The restriction will be clearly indicated by traffic signs. This Order, which follows an emergency notice, will come into effect on 15 August 2018 and it is anticipated that the restriction will be required until 31 August 2018.